Vacation began in a very uneventful way. For the first time in years Danelle and I had planned twelve days, in a row, together and away. On Wednesday morning we pulled out of the driveway and headed to Berkeley Springs, West Virginia. Berkeley Springs has a lot of unrealized potential as a romantic getaway spot. It has rolling mountain views, mineral springs bubbling through the town, spas, restaurants, and quaint little bed and breakfast places. It’s cute, and I’m sure some people really love it, we found it just “okay.” Our B&B was nice but the bed was lumpy and there was so much stuff in every room I was sure I was going to destroy something. The restaurants tried too hard and the food was just blah. The spa was nice but my massage therapist at home is far better, but no matter, it was two days of doing absolutely nothing which was a wonderful time of Sabbath. Friday we rolled out and headed for Erie, PA which is Danelle’s hometown. That evening we gathered with Danelle’s two sisters and respective spouses, children, and others and headed to Waldameer Amusement Park. It was a great evening riding classic rides and hanging out. Danelle and I even rode the Ravine Flyer II (though nobody could tell me what happened to Ravine Flyer I and that's disconcerting…LOL). 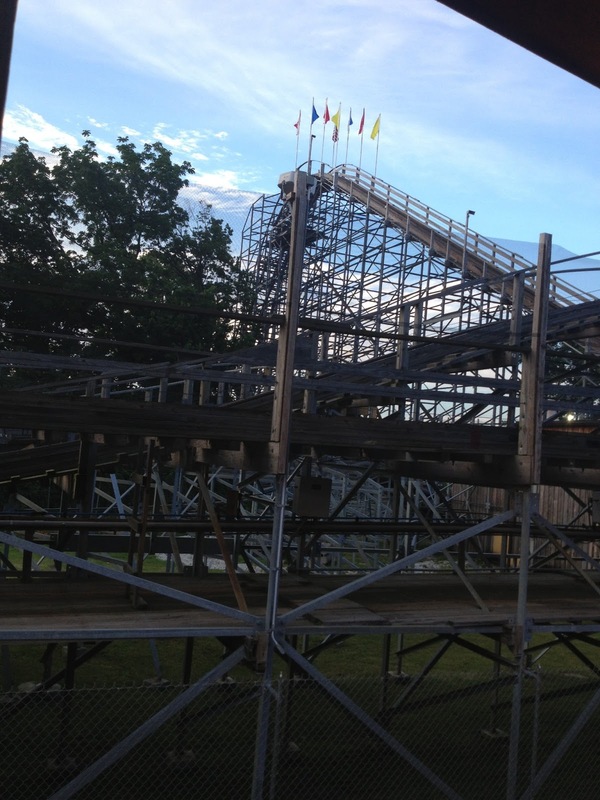 This roller coaster is one of the top ten wooden coasters in the US. It creeks and pops, and throws you around like you are in a washing machine. One curve was so hard I’m sure I bruised a rib. The next day the family gathered again for a pool party and cook out at a friends’ home. Typical of the types of events there was “bad” food (cheeseburgers, treats, etc. ), lots of beverages, sunshine, and chlorinated water. The kids hardly came out of the pool all day. The sun was bright, the beverages cold, and the food was plenteous. After spending eighteen months on Naturally Slim I abandoned all positive dietary practices and ate way too much. That night I chewed TUMS and tried to recover from hours of over-indulgence. Sunday morning arose and we headed to worship at Christ United Methodist Church, Erie, PA. The people were friendly, the service was good, but I was having difficulty sitting still. I was anxious and my abdomen hurt, not like a typical stomachache, but constant with moments of stabbing pain. I have no idea what the pastor said (though Danelle said it was really good). When we arrived back at the room we determined that I’d skip the afternoon outing to the beach and try to get over this stomach thing so I could enjoy the dinner party that evening. At 9 am the pain was annoying; at noon it was disturbing and I couldn't get comfortable; at 3 pm the pain was distressing. I texted Danelle and told her to come we needed to go to the hospital. I assumed that I was having a gall bladder attack in response to eating like an idiot the day before. I had already revisited the contents of my breakfast and some of the previous days fair so there was nothing left inside except for the pain. After the longest ten-minute drive of my life we arrived at St. Vincent Medical Center, Erie, PA. The emergency room was packed (typical Sunday night) with kids with ear infections, a soccer injury, a man who smelled of cheap alcohol, etc. We checked in and I proceeded to pace, or sit, or stand in the corner, completely unable to get comfortable. To be honest I have no idea how long we waited though it seemed like an eternity. We finally went back and after a preliminary assessment the doctor ordered an IV with some pain meds (thanks be to God) and an ultrasound to confirm gall bladder involvement. From this point on everything is screened through a medically induced screen, mostly filled in by my hearing from Danelle who, all this time dressed in a bathing suit and cover dress, refused to leave my side. We had the ultrasound, but as the tech was working something caught her eye. Though it seemed like only minutes to me, Danelle indicates that I was in that room for a significant period of time. She took pictures, made notes, moved a centimeter, took pictures, made notes, etc. In hindsight Danelle says it was obvious that she saw something really significant but, of course being a professional, couldn’t say anything. She hurried from the room to share the results. We headed back to ER but by the time we got there another transporter was there to take us for a CT Scan, just to “confirm a few things” (great lesson here, medical people are the masters at being intentionally vague). We had another scan and then were eventually transported to a room on the eighth floor. Danelle went back to the hotel room to change and returned to spend the night on those super-comfy vinyl hospital recliners. The rest of the night is a blur of shots, vitals, meds, discomfort, and prayers. 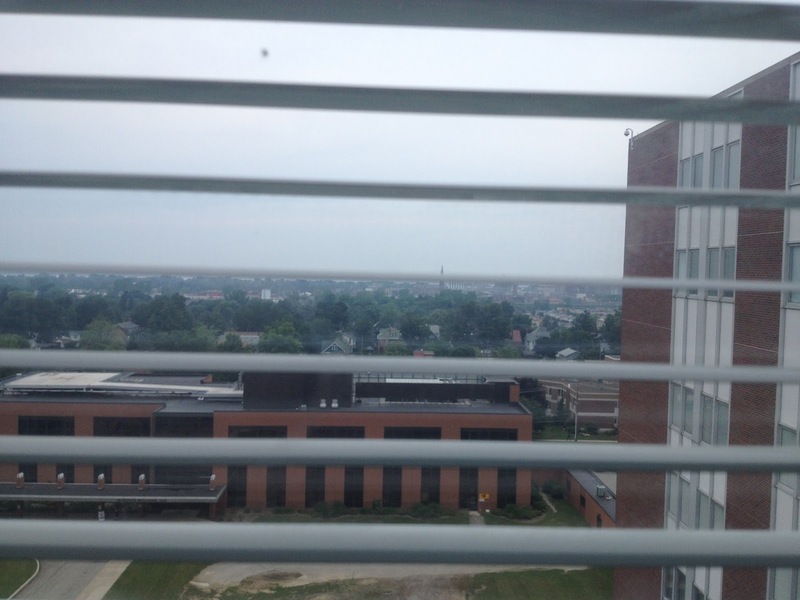 I would like to say that the staff on the 8th floor of St. Vincent Medical Center is amazing. From the housekeeper to the unit secretary, every nurse, aide, and PCA were in the game 100% to do all they could to relieve the pain and help us get answers. They were solicitous to Danelle, and would do everything in their power to help me in any way they could. This team was something special. To be honest Monday and Tuesday were pretty much a blur. There were more tests, lots of lab work, and more tests. The final test of Monday was a CT Scan assisted needle biopsy. Sounds fun, huh? They essentially take a three-foot needle and stick it through your gut, well not all the way through, and it’s probably not really three feet long, it just feels like it. After that test essentially all other tests came to a screeching halt. After some time Monday I was allowed clear liquids, then on Tuesday a “soft diet” and had the worst bagel of my life with some horrible eggs. Yep, hospital food is hospital food everywhere. I was moved to oral pain meds, IV fluids were slowed down, and my head began to clear. Danelle had spent hours and hours in watching over me in our small room. We began to walk the halls, make lists, and do anything we could do to occupy the time. Now let me back up for a second, when we had the consult with the hospitalist (doctor of the hospital) this very straight forward young man let us know right up front that they were testing for some form of pancreatic cancer and that, while it could be benign, it was his suspicion that my condition was far more serious than was previously considered. While this was hard news, receiving it on Monday evening gave us some time to begin processing what it means to watch decades of your life evaporate before your very eyes. In the following twenty-four hours we began sifting through our priorities, refocusing our lives, and reevaluating everything. We prayed for guidance and, amazingly, felt God’s presence with us the entire time. Some people say they feel abandoned by God at times like this, and don’t get me wrong, it’s tough on your faith to get pummeled this hard out of the blue, but rather than feel abandoned, we have felt as though God is in the room with us holding us together. And we sobbed. I don't mean shed a few tears, I mean we were held each other and sobbed. We cried over the grandchildren I would not see, and how I’d miss their baptisms, graduations, and other key moments of their lives. How I’d never walk my daughter down a long church aisle and allow some man to take my place in her life. Danelle and I wept over the years that were snatched from us in one crucial moment. How all of our plans of growing old together were suddenly just a dream. 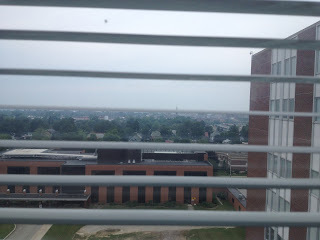 We are still crying sometimes, in the midst of trying to recover some normalcy and while making sarcastic jokes about cancer, the shortness of life, and the irony of what I did on my summer vacation. On Wednesday night, after an interminable wait, the diagnosis was confirmed. I have neuroendocrine carcinoid. When I received the diagnosis it wasn’t this clear, however. So many medical words thrown out so fast that my wife and I (both humanities people) had to scribble them down. Words like adenocarcinoma, neoplasm, metastasized, peripancreatic, etc. A very nice doctor of African descent delivered the official news. What that means is that while I'm sure he was very clear his accent made it very difficult to understand those long, complicated, medical terms. He said I’d have to stay until I had an oncology consult the next day and that perhaps I could be discharged by noon tomorrow. Whenever you hear the words “pancreatic” and “cancer” in the same sentence red lights should start flashing and alarms start blaring. A quick look at the American Cancer Association website confirmed that most patients who have a diagnosis of pancreatic cancer live six weeks to three months. My head, still struggling to overcome the effects of painkillers was spinning. I had a million questions, and a million things to do. I had to get out of this room, get somewhere normal, make sure I had a plan to insure my family was taken care of without me. I didn’t have time to wait around to talk to a cancer doctor that I’d never see again. What was he going to tell me new? That I was dying? I got that, check, move on. The cloud of sadness Danelle and I had been valiantly trying to hold at bay since Sunday suddenly filled the room with full force. Like a scene from the last Harry Potter movie, “death eaters” stormed our life’s cozy castle and we saw our hallowed walls of hope begin to crumble before us. After the doctor left, Stephanie, a young and extremely capable nurse, slipped into our room without cart or chart and just stood next to the wall. To this day I know that God placed her on this floor at this moment for us. She was not supposed to be working and, as a matter of fact, was only working a four-hour shift to cover until the assigned nurse could make it in. She had been called in at the last moment. She had been the one to take the biopsy report, she had been the one to make sure we knew, and now she was standing in our room to make sure we understood what the doctor had told us. She explained the terms, spelled the words so Danelle could write them down to look them up. We then began to ask if the attending doctor would be up soon? We wanted to leave. I even told her that we would be leaving tomorrow morning AMA if necessary because I wanted to go home. Sometimes you can see the light go on in somebody else’s eyes. An idea occurs to them as if whispered by a divine source. Stephanie realized that there was no reason we “had” to see an oncologist tomorrow here in Erie, it was just standard procedure. That we would not be getting treatment here, we would be headed home to North Carolina, home of some the preeminent medical facilities in the world. She indicated that she was going to contact the attending physician and see what she could do. There were many saints at St. Vincent who made our horrible stay bearable, Stephanie remains my angel. As she left to begin trying to find a way for us to leave we looked at our list of people to call. A couple of times I’ve said that the only thing worse than being told you have terminal cancer is having to call people and tell them that you have terminal cancer. “Hi honey, its dad. How’s it going? Oh me? Not so good, I have terminal cancer.” No that’s not what I said, but it’s what it felt like. Calling your child and telling them that you are dying is one of the toughest things you will ever do because you know that you are inflicting such pain and that you aren’t there to hold them and let them cry in your arms. I knew Lydia had been waiting days and she kept asking and kept asking and kept asking. She knew it was going to be bad. She is extremely, sometimes scarily, intuitive. She reads every vocal inflection, every word or change of words, she is like some sort of pastoral Jedi. She knew it, we confirmed it, and it broke her heart. I hung up the phone and just sobbed. But wait, there’s more…yes like a bad infomercial that was just the beginning of the essential calls we had to make. One to my sister who, seventeen years older than me, was more like my mom growing up, she agreed to tell my brothers. Then my best friend to control the vocational/pastoral rumor mill. By this time I just rolled over, an emotionally exhausted introvert who just laid my life out before so many people and Danelle took over. The calls were interrupted by the arrival of the attending hospitalist who did a cursory exam and said that in light of the fact that we weren’t local and would not be receiving treatment here, we could be discharged tonight with our chart and files as long as we signed a form indicating that we would follow up with my primary care physician for a referral to an oncologist by Friday. Of course we agreed. I had already contacted my doctor and had the wheels rolling. She issued the discharge orders around 7 pm, the nurses station was buzzing as the unit secretary, a pixie of a young woman who is obviously the administrative glue of that floor, began flinging charts and making copies. It had become the mission of that team that night to get me out of the hospital and on the way home. I have never seen a group of medical professionals, or any group of professionals, work with such intensity, they were amazing. Danelle was sent to the pharmacy for prescriptions, paperwork was completed, copies made, and a DVD of all the pictures from my sonogram and CT scans was produced. IV lines were removed and orders given. While they medical team was buzzing Danelle was making calls. I have no idea how many calls she made to relatives, friends, and family. She was brilliant, delivering very difficult news calmly, spelling out the terms, and being medically vague (we are quick learners). About 10 pm on Wednesday, July 10, 2013 we made our way out of St. Vincent to start a new chapter in our lives. I’m glad you are coming along for the ride. That was my summer vacation. Lord have mercy. Bless you, Marty. With you in prayer and whatever else you ask of me. Brother, have no words, no words. You ARE a blessing. Deep, deep prayers your way for you and your family. You are both in my prayers. May God do great things through this! Prayers lifted. Words fail. Care and compassion abound. Marty, you've always been a amazing colleague and leader. My heart goes out to you, Danelle, and your family and those of us who hope for a miracle and grieve this illness with you. If I can help in any way when you are in Durham, please let me know. "Come Holy Spirit, fill this family with your healing grace." I am a friend of Hunter Preston from years back when he was the youth pastor intern at Front Street in Burlington. I live now in Seattle. My husband was diagnosed in March of 2010 with Stage Four colon cancer. I'm praying for you...for Danelle. I'm in seminary at Seattle University...you are now being prayed for by the School of Theology and Ministry at SU and by the good people of University Presbyterian Church...more ribbons for the tapestry of prayer that lifts up both of you. Marty and Danielle, words seem so inadequate, but we lift you in prayer, and entrust you to God's great and eternal love.